Attack is an important aspect of combat, as it determines how accurate your hits will be on your opponents. As your Attack level increases, you'll be able to wield stronger weapons. By clicking on the crossed sword icon (shown in the below picture), you'll be able to see which attack style you're currently using, and you'll be able to switch between the different styles. Each attack method is named differently depending on what weapon you are using. Usually, the order of attack styles is Accurate, Aggressive, Controlled, and Defensive. You can find out the exact name for each style by hovering your cursor over the button. The pictures of each style will also help you to determine how you want to attack. You will also notice the Auto Retaliate button. Auto Retaliate basically tells your character what to do when you are attacked by another force. If you have this option on, then your character will instantly start fighting back. If this option is off, then your character will stand and do nothing, until you right click on the force and select the option to "Attack". When you select an attack type, you'll gain experience in that combat skill when you cause damage to an enemy. You will always earn experience in Constitution. You can earn experience in attack, Defence, strength, or all 3, depending on the style you use. Accurate - hits more often; gives 4 exp to Attack per damage point. Aggressive - stronger but slightly slower; gives 4 exp to Strength per damage point. Defensive - increases the chance to block; gives 4 exp to Defence per damage point. Controlled - a combination of all; gives 1.33 exp to Attack, Defence and Strength per damage point. If you select the body icon (in the above picture), you'll see the equipment you are wearing. At the bottom of the body menu, you should find a button labeled "Show Equipment Stats". Clicking that button will pop up a box showing what you're wearing, an enlarged picture of yourself, and your stats. For now, we'll only discuss the Attack Bonuses, but you'll also see Defence Bonuses. Attack Bonuses will give you more power with attacks of that type. So for instance, in the above picture there is an added +98 attack bonus for Slash attacks. This means that the Dragon Scimitar is a good Slashing Weapon. The higher the bonus, the better a weapon is when using that attack style. Stab - a penetrating attack, common with Daggers. Effective against chainmail. Slash - a very common "swiping" attack. Effective against light armor like robes or Dragonhide. Crush - a common attack with Maces, Hammers and Mauls. It's very effective against heavy armor like platemail. Magic - often negated by armor and weapons, but can be increased with staffs. Allows you to hit harder with Magic. Ranged - Often negated by full helmets and armor. It allows you to hit harder with ranged equipment. Strength - This effects how hard you hit. Better metals will give higher strength bonuses. This section will describe the different weapons in RuneScape. The dagger is the most basic weapon in the game. A fast and versatile weapon, the dagger is most useful when poisoned. Its speed will give you an advantage over low Defence monsters and players. It is one handed. Advantage: Speed and the ability to be poisoned. In Lumbridge, you'll come across an Attack Tutor, who will give you a free Training Short Sword. This item (like all other Training items) can't be dropped or traded to other players. Claws are nearly the same as daggers, and they are just as fast as them. They cannot be poisoned. They are 2 Handed and Members only. You must complete the Death Plateau Quest to make them. Types: Claws come in all metals, from Bronze to Dragon. The short sword is a fast weapon mainly used for stabbing. They deal a little more damage than daggers, but they're not quite as good as a Long Sword. Best to stick with Long Swords if you can afford them. 1 Handed. The mace is a crushing weapon used mainly by monks or prayer beasts due to its slight prayer bonus. Rarely used because of it's low max hit, which makes them relatively cheap. This weapon is good against platemail. It is one handed. Advantage: Slight prayer bonus & good against platemail. The scimitar is a weapon most used throughout the F2P worlds. A good compromise between speed and strength the scimitar proves to be a very popular weapon with most players. This weapon will give you an advantage over low Defence monsters and players. It is one handed. Advantage: Fast speed & Moderate strength. Long swords are another popular weapon in the game. They too have a good compromise between speed and strength. A weapon popular with members the long sword is usually the choice of weapon to go in the wilderness while in a Members world. It is one handed. Advantage: Moderate speed & Moderate strength. Spears are rarely used in the game. The spear is both slow and weak but has all styles of attack. It is members only and is 2 handed, except for the Bone Spear. They are the only weapon classes that can be poisoned with Karambwan Poison (KP). because of its attack styles. 1 Handed. 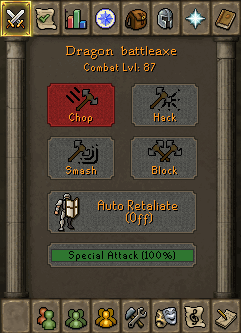 Recommended Attack Style: Smash on platemail, Hack on robes and dragon hide. Questionably the most powerful weapon in RuneScape, but not the most widely used. Due to their size, you must hold a 2 Handed sword with, yes, both hands, so you cannot use a shield. Despite this, the 2 Handed sword was considered by most to be the "Best" weapon in RuneScape Classic, due to its general power. This changed when the newer RuneScape was launched, and the speed of the 2 handed sword became a problem. Always a good weapon to use when showing off your Maximum Hit, but now rather neglected otherwise. Also, when a 2-Handed Sword is equipped and the character is wearing a cape, the bottom of the cape moves back and forth. Types: 2 handed swords come in all metals, from Bronze to Dragon. Recommended Attack Style: Any, against platemail. These bulky weapons are newer to the runescape world. They boast a very high strength, but have quite a slow attack speed. Some think their power overcomes this disadvantage. 1 Handed. Slow but strong, the halberd is one of the more popular weapons. Despite it being slow many players use it as it has a great advantage of being able to attack two square distances away and even over some obstacles. They are Members-Only, hard to obtain and 2 Handed. Hatchets are fast but weak, as they are made for Woodcutting. They have lower bonuses than regular items or the sort. 1 Handed. Not very fast, and not really made for melee combat, these provide users additional magical focusing for attacking. You can set attacking spells to autocast, and some allow you to use some spells that you cannot use without the appropriate staff. More about staffs can be found in the Magic Guide. Advantage: Autocasting Spells, Elemental staffs stops you from wasting runes of a kind. Also, the best style while casting an offensive spell and at the same time carry a staff with you is to choose focus-block, as it gives exp to Defence as well. So in whole, you will receive Magic, Constitution and Defence experience. Clubs have strong smashing bonus (Bone Clubs), Blackjacks can stun. They are one handed. Bone Clubs can be found in Lost TribeMines, and blackjacks in The Feud Quest. Crossbows are a different type of ranged weapon, using bolts, not arrows. They are slower, but have the advantage of being 1 handed, which means you can have a shield with it. The better the bolts, the better the damage. Types: Regular, Phoenix, and Bronze to Rune. Ogre bows have a strong ranged bonus, are the only bows to be able to shoot ogre & Brutal arrows, and are made for Chompy Hunting. The first chompy bow is quite slow, but the composite one is faster. 2 Handed. There are many types of throwable items. Knifes and darts offer less damage, but have incredible speed when used with rapid and can be poisoned, and you can smith them. Javelins and Throwing axes offer more damage and durability, but less speed and cannot be poisoned. These items are not smithable either. Holy water vials (Legends) offer damage versus demons, but are ineffective against anything else. All are 1 Handed. Advantage: Stackable, 1 Handed, Speed. 70 attack to wield and is called a whip for short. Advantage: Deals high damage and fast. The only real disadvantage of the Abyssal Whip is the fact that you can't train Strength with it, unless you use the "Controlled" style which also trains your other combat stats. The granite maul deals more damage than a whip but is much slower and is two-handed. It can be obtained by slaying Nechryaels and Gargoyles. There are several different kinds of Barrows weapons that belong to the brothers. They are actually part of the separate sets that give extra bonuses. Types: Torags Hammers, Veracs Flail, Guthans Warspear, Dharocks Greataxe, Kharils Crossbow, Ahrims Staff. Advantage: very powerful; each set has specific bonuses. You can get these from completing the Enchanted Key Mini-Quest, and they are also known as God Spears. Types: Saradomin, Zamorak and Guthix. 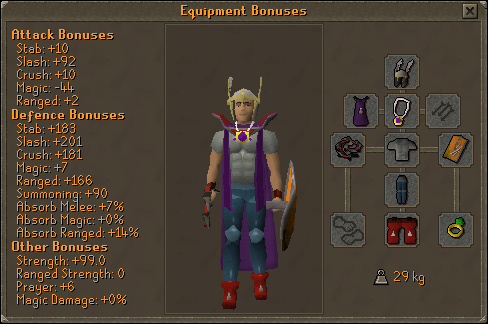 Obsidian equipment includes the set of armour and weapons from the city of TzHaar. The wield any of the weapons, you must have 60 Attack, Strength, Magic, or Ranged. To wield any of the armour, you must have at leats level 60 Defence. Types: Maul, Mace, Sword, Knife, Staff. Flowers are one of the weakest weapons in the game, as they reduce attacks by 100, and are more for decorative purpose. They sprout from mithril seeds, Or Trollweiss is found during Troll Romance Quest. 1 Handed. Rubber Chickens were easter's drop, but they are wieldable and are another one of weakest weapon in the game (along with Flowers). 1 Handed. There are several items and other abilities that can temporarily increase your Attack.